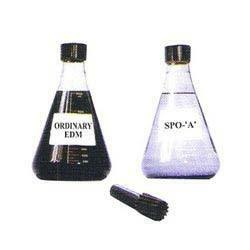 We are a leading Wholesale Supplier of edm oil sparking oil die electric fluid from Mumbai, India. We have gained rich industry knowledge of Manufacturers premium assortment of EDM Oils such as EDM Oil Sparking Oil Die Electric Fluid to our valued customers. It is extensively used as general purpose mold and dies applications involving optimum rates of metal removal, proper flushing and close tolerances. It is low in viscosity to facilitate excellent cooling of electrode as well as work-piece. It can be availed at reasonable rates. Looking for EDM Oil Sparking Oil Die Electric Fluid ?